The pepper crop was introduced in la Vera during 16th century by the Hieronymite monks of Yuste. 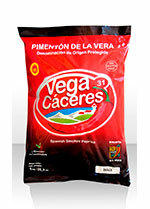 Since then it has spread across La Vera and become one of the most interesting products of the region. Here in La Vera, the pepper crops grow easily due to the clime of this area, which has a soft winter in regards to the temperatures, and a dry summer. Also, there is plenty of water due to the River Tiétar. The peppers grown here are of the species “Capsicum annum” and the sub-species cerasiforme and longum, which produce three kinds of paprika: Sweet, Bittersweet and Hot. The crop starts in March, in seedbeds, where the plants stay until May, when they are transplanted. The crop is harvested by hand at the end of September, when the fruit is ripe and perfectly red. The peppers are dried by the farmers using smoke in drying chambers with a vertical airstream and a fire on the lower floor of the drying chamber. In the upper floor the peppers are placed at 3 meters of height, over a grid of pine wood bars. This drying system is due because La Vera is a very rainy place during the fall. 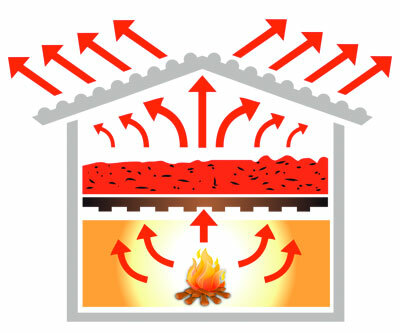 The heat and smoke produced by burning the oak wood and holm oak wood rises through the drying chamber by convection drying and smoking the peppers placed on top of it. The roof is made of Arabic tiles to allow the smoke to escape out of the drying chamber, removing the moisture inside the drying chamber. … to be completed. During this process, the peppers have to be stirred inside the drying chamber, in order to obtain an homogeneous product. This traditional drying method, slow and gentle, ensures the amount of carotenoids in the peppers. This is possible as the metabolic life of the peppers doesn´t end with the harvest. Actually, for a short period of time, enzymatic processes remain active, enabling the biosynthesis and transformation of pigments. This feature is unique of this drying system. This drying process gives to the Pimentón de la Vera its essential characteristics: aroma, flavor and color stability, which differentiates it from other kinds of paprika. Our engineer controls all the steps followed by our farmers, from the selection of the seeds, to the drying process. We continue with the training of our farmers in cultivation, fertilization, drying methods, etc. This strict work methodology enables us to obtain a product of the highest quality possible.